Neighbor-friendly lighting is a lifestyle enhancement for everyone and is a matter of safety, common courtesy and avoidance of pointless waste. The opposite of neighbor-friendly lighting is nuisance lighting, which can be a source of friction between neighbors, a safety problem, an eyesore (both literally and figuratively) and even create new security problems instead of solving them. As more people move into your community, there will be more residences, more businesses and more thoroughfares—i.e., more things that will be illuminated. Doing this in a consciously neighbor-friendly way, as opposed to the default practice of just installing what turns out to be nuisance lighting, will mitigate one form of urban blight as the community inevitably grows. And in neighborhoods out in the country, neighbor-friendly lighting helps preserve the rural character of the community. The first principle of neighbor-friendly lighting is the reduction or elimination of glare. Most night-time glare comes from light directly entering your eye from unshielded sources. This means either fixtures that shine in all directions, or fixtures that are directional but improperly placed or aimed. The more unshielded light sources there are in your field of view, the more your night vision will be impaired by the four causes just mentioned. If you are trying to view some scene at night (e.g., to see where you're going or avoid danger), you will have the best view of it if direct light from the source illuminating the scene is not invading your eyes. 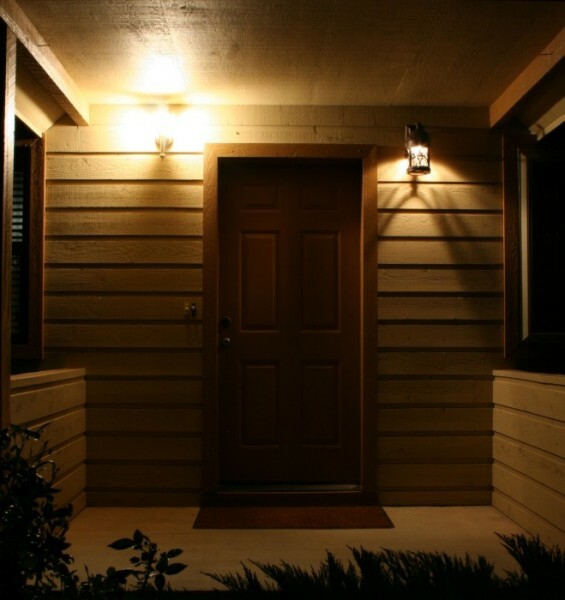 The second principle of neighbor-friendly lighting is the reduction or elimination of light trespass. This is the kind of light you don't want your neighbor shining into your bedroom window while you're trying to sleep. Properly illuminating what it is that actually needs to be illuminated (assuming it needs to be illuminated at all) is the way to prevent light trespass. Glare and light trespass are two sides of the same coin and generally have the same solution. When neighbor-friendly lighting practices are followed, this not only benefits you as a neighbor. As a driver, you need to maintain your night peripheral vision at all times. You don't want to run into someone or something while looking away from an unshielded light to avoid the pain from the glare. And what is less well-known is that after driving by something like a badly overlit filling station, your peripheral night vision on that side can remain impaired for some time afterward. You won't know this because your brain interpolates by filling in a plausible image; but this image won't include things like a child or animal about to dart onto the roadway. As a pedestrian at night, you need to maintain your night vision to see the ground you are walking on and avoid tripping hazards. A single unshielded yard light, even one hundreds of feet away, can shut your night vision down enough to blind you to what you're about to walk into. If you're an outside night worker (drilling rig, freight yard, etc. ), you may be working around dangerous things—things you need to see. This is like the case above when you're a driver, except that when you avert your eyes to avoid painful glare, it may be you who gets run into or harmed. Your employer needs to install neighbor-friendly lighting not just for the benefit of the business' neighbors, but also for your safety as an employee. If you want to look upward at night and see the universe, the featureless haze known as skyglow is just as troublesome as an unshielded light in your field of view. Skyglow mitigation comes for free as a consequence of neighbor-friendly lighting. The unshielded light source blasting into your bedroom window so you can't sleep is probably blasting waste light into the sky. As an electric power ratepayer, you save money when you illuminate only what needs to be illuminated and do so only at brightnesses that are comfortable for neighbors and passers-by. People who have hundreds of watts of lights shining all night into people's eyes, into people's windows and up into the sky are penny-wise and pound-foolish when they complain about electric rate hikes. Lights glaring in the eyes of neighbors and passers-by will reduce their ability to see any prowlers in the shadows you are hoping to illuminate. Unless you are expecting an attack by parachutists, lights you shine into the sky are of no security value. An electronic copy of this article (and the rest of the Neighbor-Friendly Lighting website) is at neighborfriendlylighting.com.